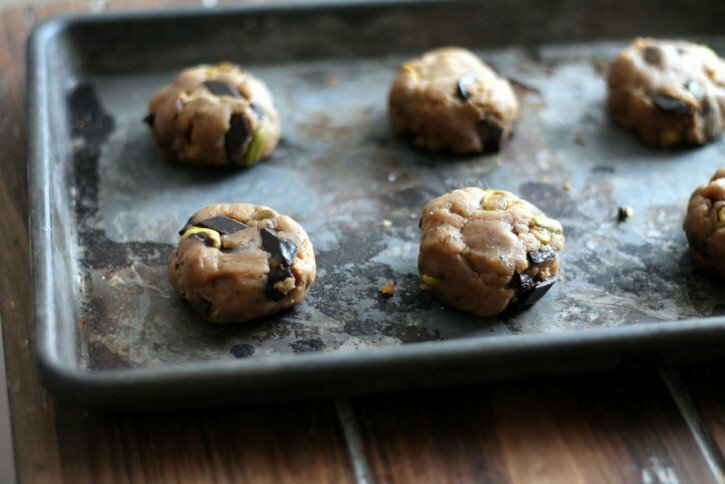 Imagine my famous brown butter cookie dough packed with pistachios, chocolate chunks, and a little coffee – this is a truly incredible flavor combination that you won’t see anywhere else. Of course, with all of my cookie recipes there’s always an interesting story on how they were crafted. This one is no different. Every time I visit Tony, I’m always asked to make cookies. Actually I’m not sure if he asks me. Usually I just get off the plane and immediately have a strong urge to trash up the kitchen and bake ALL THE THINGS I can think of. So typical. Truth be told, I love being able to leave him special home baked treats. Since we are long distance, I always feel like baking shows how much I care. It’s like leaving a delicious little treasure behind and I’m secretly hoping that every time he enjoys a cookie, he’s thinking about how much I miss him. Don’t you roll your eyes. I can’t help it; I’m seriously the biggest romantic on the planet. So Tony and I are headed to this used bookstore we stumbled upon and as usual I can’t make up my mind about what I’m going to bake him before I leave. I had about 10 ideas in my head with multiple twists. Then Tony starts throwing off my cookie game with crazy requests. For example, he asked if I could make a Snickers bar into a cookie? Not actually stuff a Snickers into a cookie, but make a Snickers cookie. I think he has some sort of belief that I’m basically a cookie queen or a baking wizard. Do you see a lightening bolt on my head? No. But there might be a whisk. I should stop with the jokes. 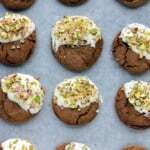 A few minutes later, Tony mentioned pistachios and I immediately knew that these cookies were going to happen. Here’s a little more info on these chocolate chunk magic bombs: They’re made with brown butter so the cookie dough is extra caramel-like and rich. The dark chocolate melts into the dough when baked and forms giant ooey-gooey puddles that I totally want to dive in (if I was Polly Pocket). The pistachio add a nice texture and a lovely flavor. Oh and the coffee? 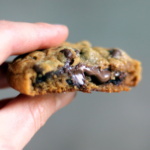 It’s what makes this cookie extraordinary. It isn’t overpowering, but simply divine. Mixing coffee and brown butter was something I should have done ages ago. 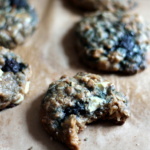 I hope you get a chance to try out these gems – they’re the kind of cookies with slightly crispy edges and soft middles. Tony calls them ‘THE MAN COOKIE’. I recommend enjoying them with a latte. 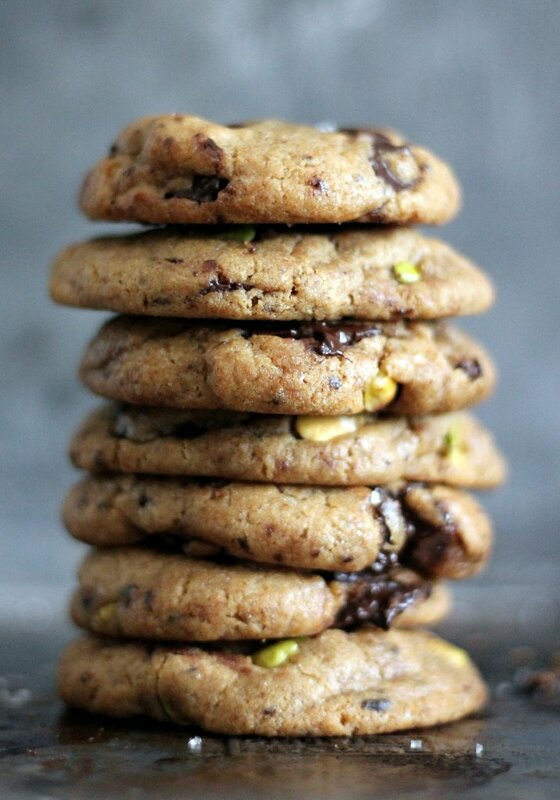 A unique cookie made with brown butter and packed with chocolate chunks, pistachios and a hint of coffee flavor. Whisk together the flour, baking soda, and salt in a bowl and set aside. Melt butter in a saucepan over medium heat. The butter will begin to foam. Make sure you whisk consistently during this process. After a couple of minutes, the butter will begin to brown on the bottom of the saucepan; continue to whisk and remove from heat as soon as the butter begins to brown and give off a nutty aroma. Immediately transfer the butter to a bowl to prevent burning. Add coffee granules immediately and give it a stir. Set aside to cool for 5-10 minutes. With an electric mixer, mix the butter and sugars until thoroughly blended. Beat in the egg, yolk, and vanilla until combined. Add the dry ingredients slowly and beat on low-speed just until combined. Gently fold in the pistachios and chocolate chunks. Wrap your dough in plastic wrap and chill in the refrigerator for one hour or place in freezer for 20 minutes if you are super eager. 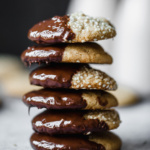 Preheat the oven to 350 degrees F. Once dough is chilled, measure out 2 tablespoons of dough and roll into a ball and place on cookie sheet ensuring there is at least 2 inches apart on each cookie. Press down VERY slighly on top of the dough, unless you want fatter cookies then leave as is. Bake the cookies 10-13 minutes or until the edges of the cookies begin to turn golden brown. They will look a bit underdone in the middle, but will continue to cook once out of the oven. Cool the cookies on the sheets at least 2 minutes. Sprinkle with a little sea salt if desired. Remove the cooled cookies from the baking sheets and transfer to a wire rack to cool completely. Repeat with remaining dough. 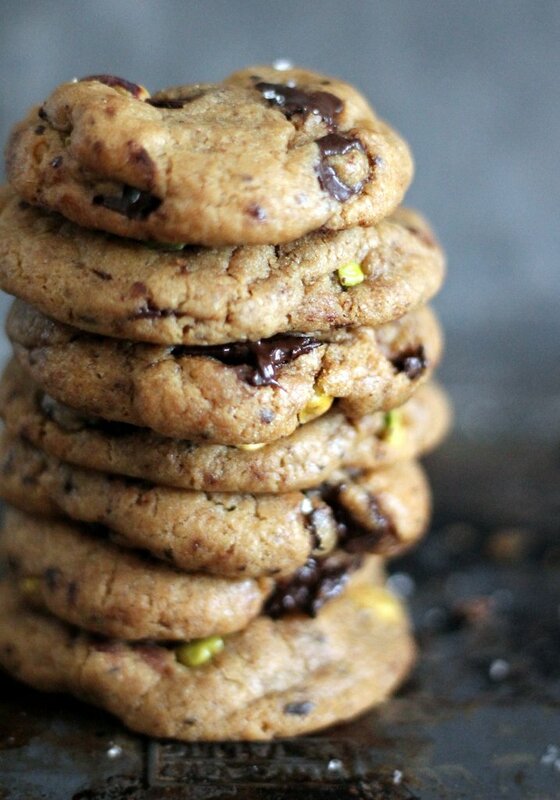 16 Responses to "Pistachio, Coffee & Brown Butter Chocolate Chunk Cookies"
I love the flavour of these cookies. They look and sound delicious! Holy moly, these need to come with a warning label! After five cookies, ‘cos I really, really needed to make sure, I think I’ve found my all time favorite cookie. You are the cookie queen! I’m so happy you liked the cookies, Nicole! They are quite irresistible! I don’t usually keep instant coffee around, hate to excess for one recipe, but this sounds so good! Could I substitute my usual ground coffee beans or would they be too overpowering? Hi Leigh! You can totally skip the coffee. I wouldn’t recommend using coffee beans. OMG! So good. The brown butter is so worth it, I had to stop myself from eating the dough after 1 taste! I skipped the coffee as I had no instant and used 2 full eggs (as I didn’t see the correction), sprinkled sea salt on top and they turned out spectacularly. Thank you! 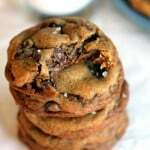 Could you use espresso powder in these? Also, are you just supposed to use egg yolks or the whole egg as the ingredients and instructions list this slightly differently? Looking forward to trying these! These are unbelievably great! Thank you for the recipe. Does this call for milk, semi-sweet or dark chocolate chunks? Thanks. 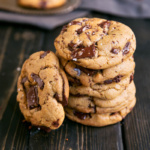 Hi Alia – I typically use dark chocolate chunks, but you could use any that you like best! 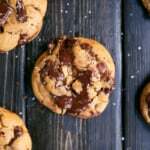 I made these cookies over the weekend and I can’t stop eating them! The browned butter really makes a difference and definitely worth the extra step! Simply delicious. I did substitute pecans for my taste preference. One part of the recipe that was unclear to me was the addition of the eggs. Was I supposed to add 1 egg+ 1 yolk or 2 whole eggs? I added 2 and it turned out fine. Hi, how many cookies does this recipe make? Thanks! Monique your recipes are unique and always successful-thank you!